When it comes to building a great referral program, remember that each one serves its purposes. For some people, they gravitate to a traditional email referral, because it captures their attention. Other people may enjoy the “in-the-moment” aspect of a pop-up screen on their mobile device. Additionally, a person may catch something while they’re Tweeting away at work, which would be right on time for a lunch special at a chain restaurant location near their job. Referral tactics are used to help businesses spread messages in a way that encourage a true call-to-action. Here are 10 different types of referral program templates to help you out. While a bold imprint right in your face will be perfect for most, there are people that enjoy subtlety. A lot of people still have time to scroll through a site and do some discovery on their own. That’s why the homepage tab is such a crucial element. They can look to the referral on their own leisure. For example, look at Boost Mobile’sset up. They have “WHY BOOST” in their tab. This allows people to do some searching on their own and actually make the effort to find out more about the company. Their they can choose refer a friend. Once, they click that tab, they’ll be able to scout for themselves why they should refer someone they trust. It’s all in an easy to do setup, and they can earn up to $25 account credit for each person they refer. This will be a great asset to help them save money on their monthly phone bill. Additionally, it can be a good way to get more people to sign up. Now, that the weather is starting to warm up in the Spring, this is the perfect time to dedicate to getting in shape before the Summer starts. There are a lot of people who may have slacked off during the winter time due to holidays, and just certain areas having a bit more brisk weather. With the right temperature outside, it gives people no excuse but to start building up for their vacations or summer gatherings. Fitoboost is a good one to help you keep your body sharp. Not only does this encourage the ambassador to stay in shape, but they can refer others to the program. It’s a way of taking true accountability, because the best marketing for this type of program is to be fit. When people see the results of the detox method, it’ll be easier to sell. Not to mention, it helps to spread a positive message of learning how to live a healthier lifestyle. By being an ambassador, that means you have some investment in this product, because you actually use it yourself. You can join this program just by filling out a form and having a blog/website to yourself. Whether it’s monetary benefits or discounts, this is certainly a good thing to do to help you get your foot in the door for referrals. For some people, there’s nothing like a traditional email with referrals. Amazon is always on point when it comes to upselling or creating a referral program. Their Amazon associates program is definitely one of the most popular on the market. For this particular campaign they have going on, it’s all about weddings. Of course, wedding season is getting there, and people want to make sure that they have everything they want and need to make things happen. For this particular campaign, they had it set from February to March 31st. This is certainly a good time to get these small, but crucial items ready for a good late spring or early summer wedding. They allowed you to create a wedding registry that had countless items on Amazon’s marketplace. Also, they could create their own registry in case they have a day of matrimony as well. They can simply use an associate’s link, and for each person they refer, it’ll double the amount from $3 to $6. Sometimes, it’s not just about referring someone. People love the art of discovery or being at the right place, at the right time. That’s why when it comes to a pop-up, it can be such a crucial moment. Why? Well, these offers don’t last very long. It may be just a 24-48 hour deal to hop on when seen. That gives any customer that comes across your store a big incentive to take advantage of a deal. Also, there’s a big fear of missing out on a great option. Karmaloop does this very well, especially when it comes to spring and summer sales. This gives people that do referrals a great chance to get signups. Whether they’re people that use a mobile device or behind a desktop, the popup comes up. 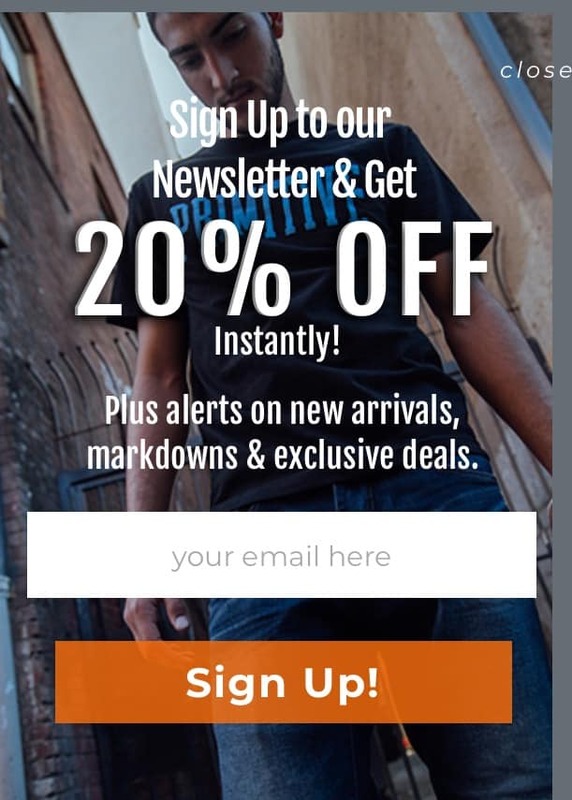 For today’s offer, it’s up to 20% off on their order when they sign up through the form. This is a good marketing promotion that will not only get people associated with the brand immediately, but it’ll start cultivating a core audience that enjoys clothing. When you’re able to get one’s attention and keep it there, that’s how you get a true win. Let your potential clientele find out what they enjoy on your brand and become a regular customer. One of the best offers is to actually do something for others and be one to get rewarded. For example, if you bring someone to a sign up, they might get $5 in cash towards their first purchase. At the same token, you can get $5 added to your account. This is a great motivator to not only give someone an incentive for signing up, but the referrer gets something out of it as well. A good example would be Drink Finity. 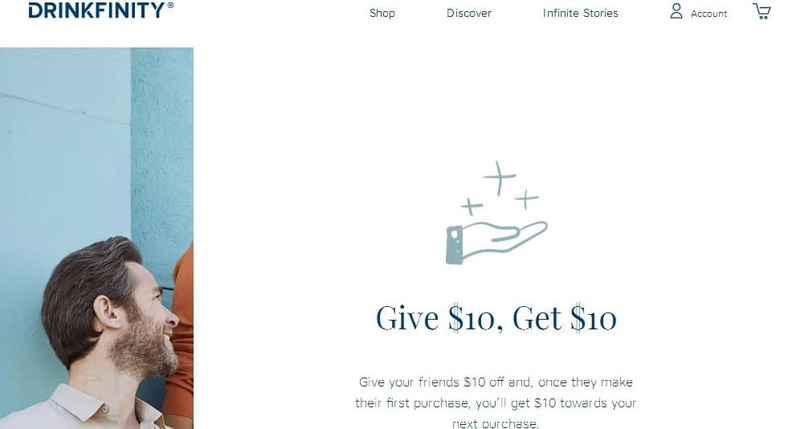 They give you any referral $10 and you’ll get $10 as a result. It’s a great method to not only get people more involved at the start, but you’ll also directly benefit as well. A lesson that can be learned by taking this example is giving helps you get more. When you offer something genuine to people and it’s useful to them, it can be a nice way to build a long-term business relationship with both sides. Keep this in mind when you start finding out what referral types you can create for your own program. Facebook is another great source to do ads. It’s all about utilizing their ad system in the right manner to meet with your brand initiatives. It could be a nice way of securing a lot of great attention to your business. Also, it gets you involved in more social media, which can be a better of engaging with different customers. In this case, we have a brand, like Gainful. 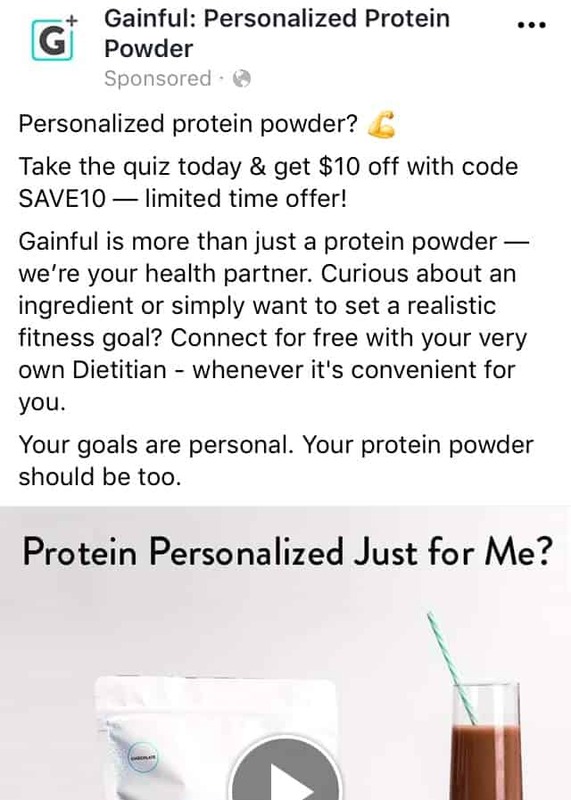 They’re about creating personalized protein powder. This is great for people looking to put on some muscle, which works well for athletes, bodybuilders, or just the average Joe that likes to stay in shape and build some healthy mass. The offer here is taking a quiz they offer and getting $10 off with the code “$ SAVE 10”. The great thing about this is getting involved with a program that allows you to find a good dietitian. That’ll help you go for the right protein powder to suit your nutrition. You need the right nutrients to help you gain lean muscle mass. Facebook ads can get you a good target demographic to increase your exposure and help you get stable customers. Use this is as a solid tool to build your following, and increase engagement for your social media presence. There’s nothing like getting a nice freebie. Think of it as a good sample before fully investing. The great thing about the Internet is the resources available to get some free items. It’ll be a nice entryway into what your brand has to offer, and give you the exposure you need in order to start making a profit. People tend to like free cosmetic or a food item. This is certainly the case for Love With Food’s referral. They give you a good offer on their product. 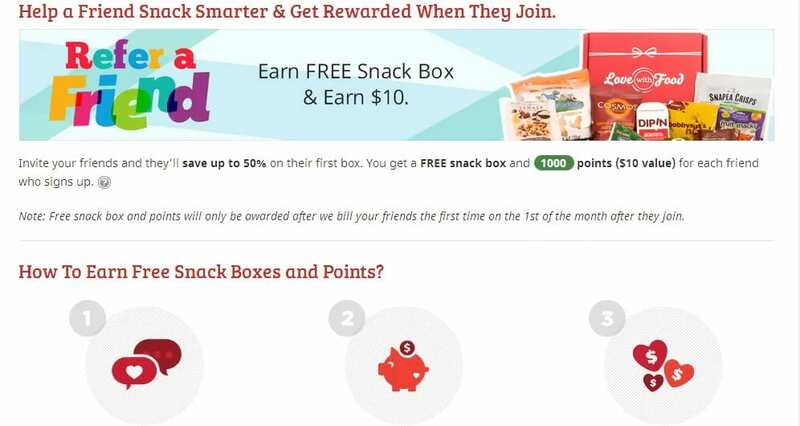 For one, they allow your friends to get 50% off on their first snack box. At the same time, you’ll get a free one and 1,000 points. All you have to do is sign up for Love With Food and send your friend a unique referral link. The company can send the free box to the friend’s address. After the billing process for the box, you’ll get a free one and 1,000 points. This is pretty simple process to start gaining more referrals. Everyone likes a good discount. Not to mention, your supporter can get a good freebie out of it. It’s a great tactic to help you build some long-term support to your brand. Nothing can really beat a classic landing page referral. For one, it’s right on the homepage. This is something that gets noticed rather quickly. If you want to make a bold statement, it’s all about having that clean yet strong look. Whether it’s a discount or a free trial, it can really help you promote what you have to offer. 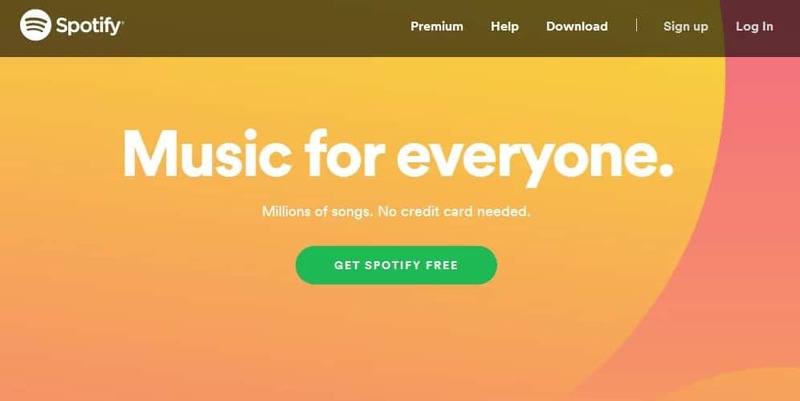 Spotify does a great job to promote their brand by saying, “Music for everyone.” They also have a tab to click on that says “Get Spotify Free.” This is important, because this captures your attention immediately. Also, it can be a good segway into helping any prospective customers find out what they enjoy. It’ll make it easier for them to do a search on your site or get in contact you about different products. In this case, it’s all about streaming music they enjoy and finding the artists that could be performing near them. It’s important to always have something to captivate the audience. When you get their attention right away, learn how to utilize that into creating long-term action on your site. Social messaging is becoming more and more popular these days. The way that people interact and respond to each other on social media is unparalleled. Whether people are in another state, country, or even in the same house, they’ll be quick to speak to each other on a social platform without even being in one’s presence. Companies have to come to find this out, especially in regards to promotions. 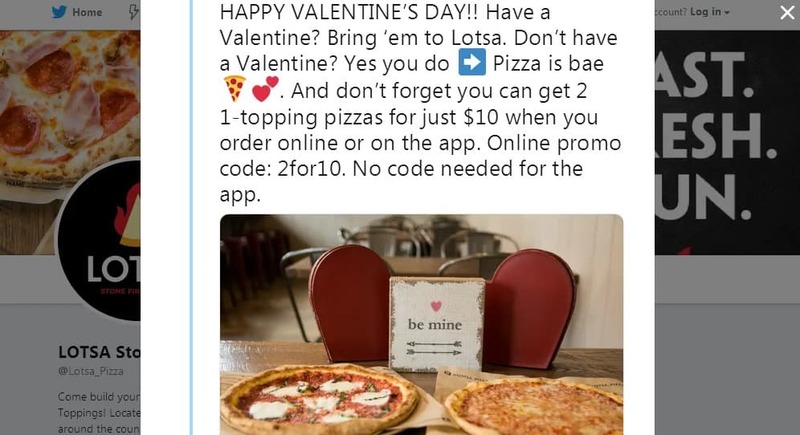 Here we have a deal with Lotsa Pizza Of course, Valentine’s Day is very popular for couples. An evening with a nice pizza, wine, and chocolate can really be a way to unwind. Keep in mind that some people just want to have simple night. They don’t care for eating at a restaurant or going somewhere fancy. They’ll simply spend time together in the home. This deal is a two for one deal, which is perfect to start a nice evening. You could place the order online or use the app. Not only is this great for securing a good offer, but it gets more users the app. This is a great way to bring in a different demographic through a mobile device. These are just some of the great templates you can use to help you create referrals. For some people, they may enjoy a more direct approach. Others might appreciate something that’s more subtle. Depending on your marketing strategy, there are several strategies you can implement to help you target different demographics. This will certainly help you get achieve more longevity for your brand. What are some tactics you like to employ for referrals? Please drop a note below. 4 Response to "Referral Program Templates – Examples All The Best Ones To Get Started"
These are nice templates, I hope people would change it a bit before using so it won’t be over used. I learn a lot from your blog, I get to use it for my Woocommerce referral program with Omnistar. This is why I enjoy your articles, they are always clear.